From the initial efforts and passion of one Canadian businessman and his family, to an American entrepreneur’s inspired innovation, to the collaboration of a philanthropists and leaders who formed Horizon in 2004—our journey to empower orphaned children is one of big vision and inspired commitment to lasting, sustainable change. Though based in the United States, our organizational roots began with a small group of determined Canadians who began working in Kenya several years before Horizon was officially formed. 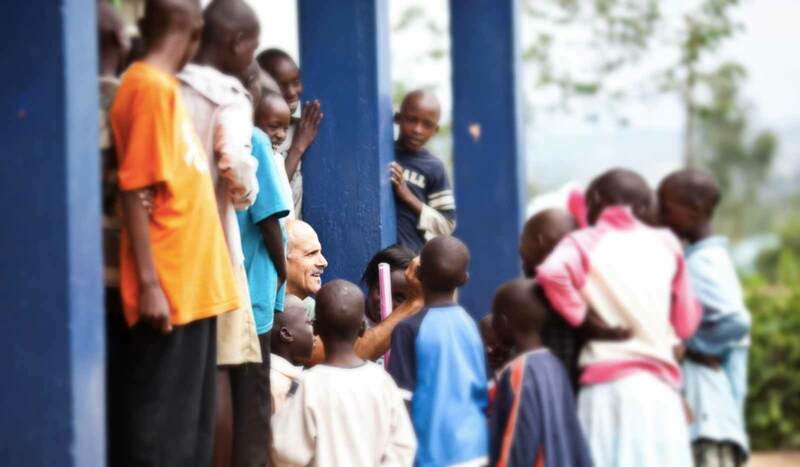 Horizon co-founder Jim Pesce surrounded by children at our Baba Nyumbani Micro Community. In 1999, one of our founders, a Canadian businessman named Jim Pesce, traveled from Toronto to Kenya. On that trip, he visited a children’s home called Kaibeyo in the small town of Eldoret, a home to seventy-five children. The facility’s funding and oversight came from a group of far-removed American businessmen with close ties to an Eldoret church leader. What he found, shocked him. With just one mama on site, evident malnutrition, torn clothing and widespread disease among the children. Jim, along with his family and a network of friends immediately got involved. They began raising funds with the hope of making a positive impact on the devastating orphan crisis in Western Kenya. However, quickly they uncovered corruption taking place among leadership on site, which prevented the kids from ultimately receiving the care they needed all along. Led by Jimmy’s daughter at the time, they brought these issues to light. Around the same time that Jim Pesce made his first trip to Kenya, Daryl Heller, an entrepreneur from Lancaster, PA, visited a government-run children’s home in Uzbekistan, in the former Soviet Union. What he witnessed left a searing imprint on his heart and mind: thousands of orphaned children loved by no one and deprived of basic health care. Human beings whose constant companions were hopelessness and despair. Returning from his trip, Daryl’s questions burned: Where could he make an impact? What could he build next? What problem could he solve? His entrepreneurial wheels began turning. Right away, a plan started to form. Soon, Daryl shared his plan with Larry Kreider of Dove International. Larry listened intently as Daryl revealed his model to effectively rescue and empower children to become self-sustainable in the underdeveloped world. In retrospect, the conversation between these two men and Larry’s foresight to connect Jimmy with Daryl soon thereafter was a crucial moment for Horizon. In addition to connecting these two vital individuals, Larry invited other key influences into the conversation to help chart a path forward and the concept of a Micro Community was birthed that would include a children’s home, school, medical clinic, farm and revenue-producing marketplace, all enveloped in a thriving, self-sustaining Micro Community. 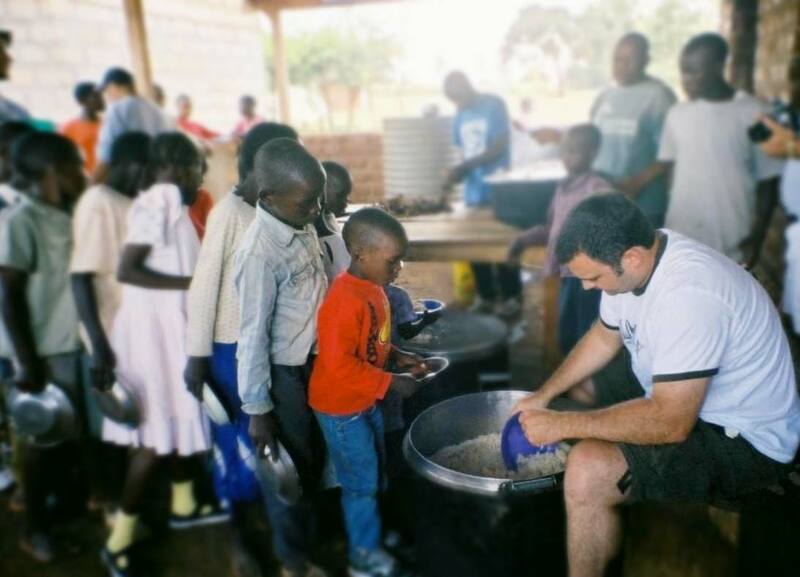 Horizon co-founder Daryl serving a meal to children at Baba Nyumbani. In 2003, nine leaders continued this discussion, one that would ripple across thousands of lives, and thousands of miles. The questions were always the easy part: How do we eradicate child poverty? How do we stop wasting money in the process? How can we invest in the dreams and potential of other human beings? How do we empower them to sustain themselves? The answers? They came with difficult, diverse and thought provoking discussion. In the end, this collaborative of forward-thinking individuals created a humanitarian model with the potential to make worldwide generational change. This group formally organized themselves as Horizon in 2004, with a mission to rescue children in need, restore their identity and hope, and empower them to a happy, healthy, self-sustaining future. As a board of investors, entrepreneurs and philanthropists with a goal of investing for good, the business-minded lens through which we envisioned effective, lasting change helped to shape our model and values to what they are today. While Horizon embraced the discarded Children’s home in Kiabeyo in 2004 and made modifications to implement part of its Micro Community model, in 2009 the construction of their first children’s home was completed. Thirty children were welcomed into their new home called Baba Nyumbani, which means ‘Daddy is home’ in Swahili. Today, that Micro Community serves approximately 90 children. Through the support and multi-national influence of our U.S. and Canadian partners, we are now replicating our Micro Community model all across the world with multiple sites in Africa and diligence completed to enter into Latin America. Our next move is to create many opportunities for people all over the world to help us accomplish our vision of building 30 Micro Communities in 20 countries by the year 2030. The question is: how do you see yourself as part of this story? You can become part of the Horizon story. Stay in the loop on our Micro Communities, updates from the children, upcoming events and everything in between. ©2019 Horizon Initiative. All Rights Reserved. Horizon Initiative is a 501(c)(3) nonprofit organization empowering orphaned children to self-sustainability through a Micro Community model. 100% of all outside donations go toward our work on the ground.